Great fun at St Kevin’s Catholic school at Dee Why with the fabulous librarian Kirsty O’Rourke. 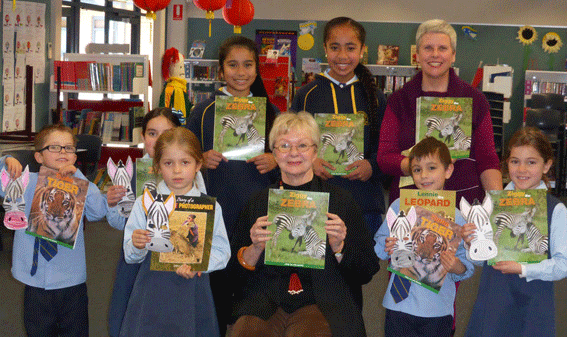 Each child had a zebra mask to celebrate the arrival of the new Ziggy the Zebra book. I’ve seen hundreds of Burchell zebras on the grassy plains in Kenya, Africa, so I wasn’t aware zebras were endangered. After doing homework about zebras I discover the Grévy and Mountain zebras are both endangered, with fewer than 2,400 left in the world. What is the difference between the Burchell and Grévy zebras? Check their ears and their different stripes. Learn more about zebras in Ziggy the Zebra book. See the video I created in the Maasai Mara in Africa.